Installation views at Corcoran Gallery of Art, Washington D.C.
Robert Oliver Swain Jr. was born on December 7, 1940 in Austin, Texas to a middle class family. His mother, Elisabeth Anne Brower, his father, Robert Oliver Swain and his older sister, Anne Brower Swain (born five years earlier in 1935), moved to an Army base within a year of his birth. His father was attending Harvard University earning his graduate degree in traffic engineering. The outbreak of WWII occurred on Swain’s first birthday, December 7th 1941, which coincided with the bombing of Pearl Harbor and his father was subsequently taken into the Engineer Corps. The family moved around to different military bases for a couple of years and when his father shipped out to Europe they went to live with his grandmother in Mercedes, Texas in 1943. His father stayed in Germany and oversaw the clearing of the Rhine River until 1946. Swain was not exposed to popular culture; this small town was located at the southern tip of Texas where he absorbed the natural, desert surroundings. In the summer, at the end of the day, when it would cool off, he would go for walks with his mother and sister. He remembers seeing cacti, irrigation ditches, the canal, and the mail train at the railroad station which fascinated him when it came through once a day. A young Swain thought the telephone poles were built as a wire network for the birds to sit on. Paradoxical in that, even though they had a function, it was only the aesthetic form that Swain saw as a child. “The mind set was that it was perceptual. In other words, you looked at things; you weren’t given things.” (Swain, 25 February, 2009) Swain’s early memories of experiencing the outdoors are what led him to want to create from that place. He only lived in Mercedes, Texas for the first six years of his life but it would be that source of the sublime experience that drives his work. After the war, in 1946 his father returned from Europe, his family moved to a suburban environment in Arlington, Virginia and his younger brother, Peter John Swain was born. His father established a successful career as the President of the International Road Federation, working for the Pan-American Highway. Swain lived across from a local art school and attended public grade school, junior high school and after freshman year of public high school, transferred to The Hawthorne School, a very small private school. Swain explains that he was very proud to be president of his class which was comprised of two students and the other student was valedictorian. (Swain, 29 April, 2009) There were only 24 people that made up the entire school, thus giving him the opportunity to learn from virtually his own art teacher. His father was the president of his high school art club. With his drivers license came many visits to the National Gallery. Early influences of the contour line and emotional feeling of Toulouse Lautrec, as well as the work of Rembrandt made a strong impression on him. While in high school he worked summer jobs in heavy construction building the Pan-American Highway, due to his father’s affiliation. When he was sixteen he worked in Guatemala and the following summer in Nicaragua. He had hopes of painting these exotic locations, but found that the rainy weather conditions and long work hours took up most of his time. The awesome greens and the complexity of color made a lasting impression on him, as well as how the palette changes and brightens drastically in the southern hemisphere. In 1959, Swain attended The American University in Washington D.C. During the summer of his sophomore year in 1961, he traveled with a tour through Western Europe for three months. He remembers his time in London, Amsterdam, Switzerland and Italy, and clearly recalls a boat ride up the Rhine. He stayed in Paris until the end of the summer, traveled to Spain and decided to stay for two years. He attended the University of Madrid and was employed by the Spanish Road Association, which also was in affiliation with his father. Spain was under Franco at the time. It was a very enlightening experience in some ways for me but it was in another century. During certain periods, the national newspaper would put out warnings saying nobody was to laugh or smile during Christmas or they would be put in prison. Religion was very, very serious. I was not a Catholic. Swain has not returned to Spain and travel is no longer a priority. In 1963, when he returned to The American University in Washington D.C., he had an entirely new perspective. When I came back to the United States I think I was really struck by how superficial our culture was, because in Spain and [the rest of] Europe, everything is connected to history. These artists who I knew would talk about Velázquez… we didn’t have that historical foundation. I came back to the United States and even though I had done art all my life…I figured I should straighten up my life and I should become something. So I kept taking art courses but I thought what I should do is come back and be a lawyer. An advisor told me I should take political science courses, which American University is famous for, so that lasted about three weeks. While attending American University, Robert Motherwell gave a guest lecture to the students. Swain remembers him discussing how much he loved Helen Frankenthaler and the talk changed Swain’s opinion of him after only knowing him as an image of a well-known artist. He also first experienced Jackson Pollock’s work when he was a teenager and thought the work was “incredible.” He graduated with a BA in Fine Art in 1964. When he returned from Spain he worked at The Phillips Collection in Washington, DC, as a guard, where his education deepened. He was required to arrive two hours before the museum opened to clean the galleries which allowed him to spend valuable time with the artworks. He especially studied the southern colors of Provencal Landscape Near Les Lauves, (1904-1906), an unfinished work by Paul Cézanne, as well as Pierre Bonnard, Pierre-Auguste Renoir, and many masters of American Modernism such as Arthur Dove, Albert Pinkham Ryder, and John Marin. The job gave him the opportunity to assist with installing exhibitions; he especially remembers an Alberto Giacometti show as well as a Seymour Lipton exhibition. This experience would lead to further opportunities and involvement in art communities beyond Washington D.C.
One of Swain’s coworkers had assisted Karl Knaths, an American cubist painter who was well represented in the Phillips Collection. Swain has been looking at his work and decided to write to him in Provincetown, Massachusetts to inquire about assisting him. Knaths agreed and Swain moved to Provincetown after graduation and became his studio assistant, earning just ten dollars a week, but it would prove to be an invaluable experience. I worked for him four hours in the afternoon, six days a week. I got a little house; he had three cottages and a main house. Tennessee Williams had written The Glass Menagerie in one of these cottages. It was very, very productive for me to work with him. The one thing is that he was extremely routine, which I am now. He got up before first light every morning and went for a walk. He would walk out on the sand dunes, he would walk through town and when the light was strong enough, he would be in his studio painting the north light. He also introduced me to the Ostwald Color System. He had a very sophisticated way of putting together color relationships. Swain worked with Knaths for about a year, and simultaneously made progress in his own work. Art dealers would come up from New York to look at the work in Provincetown and Olga Thenen, of Thenen Gallery, who was looking at Knaths’ work saw Swain’s Untitled (1964-1965, Figure 1) (fn 2) in his cottage at the end of Knaths’ property. When she saw this painting she offered to give Swain his first one-person show in New York. The exhibition at Thenen Gallery, in New York City, was put together on a “shoestring,” with three to four drawings, four small paintings, and two larger paintings. It was very challenging for Swain to get the show together and transport the artwork, but it paid off and he sold a couple of drawings. With this development he decided to move to New York. In hindsight, he believes it was not the best idea with only $500, without a job lined up, or a place to live. The paintings that did not sell in New York were brought back up to Provincetown before he left. 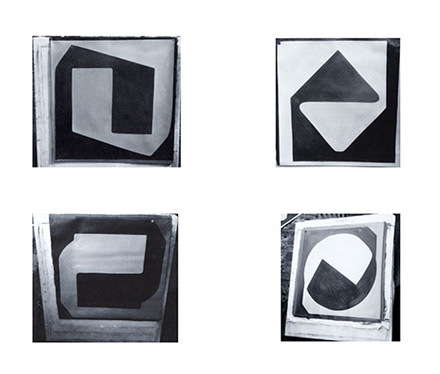 He threw out these early paintings (Figure 2) since there was no means of storage. He left Provincetown with only two 60”x60” stretchers and a box of paint. Lowell Nesbitt, who he knew from working at The Phillips Collection as a guard, let Swain stay with him while he looked for work and a home. He found a small place on 23rd Street, between Sixth and Seventh Avenues, a room in the back of the building with a sink; the bathroom was downstairs. It was a very dire situation and he had a hard time finding work. He was there only briefly because he ran into Gay Glading, with whom he attended public high school in Arlington, Virginia and was an artist who was affiliated with the Park Place Gallery. She moved to California and gave him her loft to live and work in, at Five Lispenard Street in Tribeca, and introduced him to the group from the Park Place Gallery. The loft was a small commercial space that was not residentially zoned and was constantly inspected by the fire department and buildings department. He got around this by hiding his mattress in a very large desk that he built with a lid that he could prop up when he slept. Swain soon found he was a part of a network of people who found odd jobs for each other, such as painting lofts, electrical work, plumbing, etc. Swain’s skills as a construction worker came in handy as a way to get by and allowed him the flexibility to explore his art. These highly developed skills in construction have served him throughout his life including in the construction of his current home and studio and allowing him to work in a self sufficient manner. It was a cooperative gallery where the artists were banded together and they had this utopian idea that they were going to have an exhibition space…workshops… and residents. (fn 6) I wasn’t a member of the Park Place, I was the invitee to show in the show, but the thing about it is all of the work was cutting edge and it was all experimental. It was an absolutely incredible experience. In that same year, 1967, Swain participated in another group show at Bennington College in Bennington, Vermont, which marked his early exploration into a new format, one he would continue to develop throughout his career. 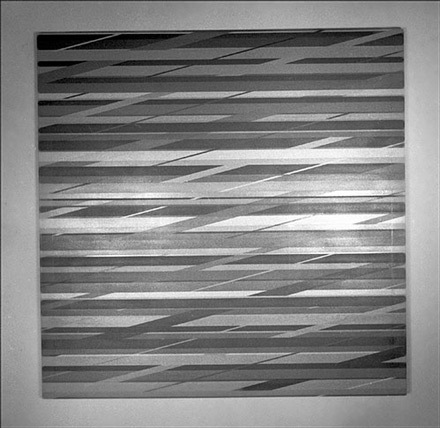 It was a key exhibition for Swain where he showed a large-scale grid piece but the success of this work was not apparent to him at first (Figure 4). He worked on the painting continuously for two to three days with no sleep. It was very large and he lived in a very small loft. He was depressed upon the completion of the work, as he could not yet see what he had created in his small studio space. “What I couldn’t do was reconstruct my intellect and understand what I had done. (Swain, 29 April, 2009) He felt that he should tell Vincent Longo, who organized the exhibition, that his painting does not quite work out the way he had hoped it would. Longo urged him to bring it up to Bennington, which was no small task. He would later return to painting the entire grid on a single canvas when he became more secure in the knowledge that the color would maintain its own identity. It is this format that allows Swain to express the kind of pure sensation he felt as a young child in Mercedes, Texas. During this pivotal year, Swain went from exhibiting at Bennington College to the Museum of Modern Art in New York. He found himself simultaneously building a sculpture with Tony Smith and creating a piece of his own to be shown in “The Art of the Real: USA 1948-1968” at MoMA. The group show also included work by Carl Andre, Jasper Johns, Donald Judd, Ellsworth Kelly, Sol LeWitt, Morris Louis, Agnes Martin, Robert Morris, Barnett Newman, Kenneth Noland, Georgia O’Keeffe, Raymond Parker, Jackson Pollock, Larry Poons, Ad Reinhardt, Mark Rothko, David Smith, Robert Smithson, Frank Stella, Clyfford Still and Sanford Wurmfeld, among others. (fn 9) Exhibiting with these American Masters would mark his first museum exhibition. E. C. Goossen, the director of the exhibition, describes the theme, “[it] is based on the premise that a significant, identifiable change has been taking place in American art over the last two decades. The diversity of the styles that have appeared may at first seem simply confusing, ranging as they do from pop art’s immersion in subject matter to op art’s appeal to pure visual sensation.” (fn 10) The exhibition explored what is “real” in the context of art at that time. “It offers itself for whatever its uniqueness is worth-in the form of the simple, irreducible, irrefutable object.” (fn 11) Goossen discusses the distinct change in the vision of modern art, “The new attitude has been turning art inside out: instead of perceptual experience being accepted as the means to an end, it has become the end in itself.” (fn 12) This “perceptual experience” is exactly what Swain was invested in. 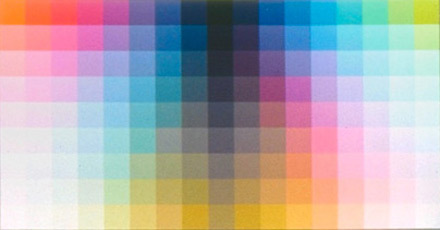 Swain not only found a new kind of formal structure in color painting, he would soon begin to develop his own color system. The first step was to obtain a larger studio space so he also moved in 1968 to Leonard Street, remaining in Tribeca, where he built his studio and tiny residential space. The cramped living arrangement afforded the back room, Swain’s large, open studio. 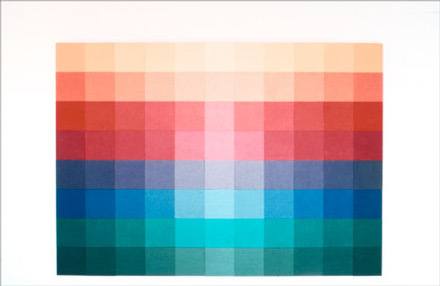 He started making hundreds of hue charts, painting swatches of color next to each other, analyzing the dark hues as they modulated down, without following any contextual idea of established color systems. “This is the paint. I’ll make this lighter; I’ll make this darker; I’ll add more saturation.” Systemizing color may have come out of his time spent studying Cézanne’s Provencal Landscape Near Les Lauves at The Phillips Collection; it was like an unfinished crossword puzzle, “when you start to guess what the next hue would be,” he explains. From that idea he decided that his color system should have a value range, a saturation range and a hue range. Through these processes Swain got to know these colors like a pianist understands the scales and notes on a piano. The colors march across the wall. They look precisely ordered, and they are. Their order looks machine-measured and mathematical but it is not. The picture is wholly intuitive. The paints were mixed by trial and error…Their spectrum is of Swain’s design…Each 24-square horizontal row moves from blue, through bluish-green, through yellow, through red and violet and back to blue again. Those two perpendicular movements are the first thing the viewer sees. It is only after he has observed them that he begins to see the curves…they are determined not by lightness or darkness, but by purity of hue…It is the viewers eye, selecting the richest colors, that establishes those broad parabolas that sweep across the wall. Had Swain not guessed his colors, had he followed a standard color system, his picture would have died…Had he followed such a system his truest hues would have stretched in straight lines across the wall. His first large-scale architectural installation was commissioned by Skidmore, Owings and Merrill, Des Moines, Iowa at American Republic Insurance Company. A major purchase by Jane Holzer also occurs in 1969 (fn 21). She is referred to Swain by his dealer, Donald Droll from Fischbach Gallery, and selects a large-scale work for N. K. Winston Corporations, Smith Haven Mall, NY, a property that was developed by her husband, Leonard Holzer. In the early seventies Swain began to further explore the grid format. Swain would cut out squares of paper and place them on the wall to determine what would be considered small and what would be considered monumental scale, to find the point when the object was no longer human scale. He discussed this idea of human scale with Tony Smith. “Doorways,” he simply replied. Smith was trained as an architect by Frank Lloyd Wright. “6 foot 8 inch - doorways;” he thought they related to human scale. Swain worked with ideas such as human scale more than mathematics. 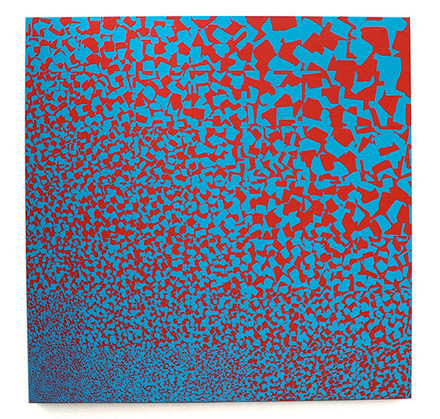 In the development of the grid paintings, the 10’x11’ canvas was one of the first formats he worked within. Over the years he explored different dimensions. 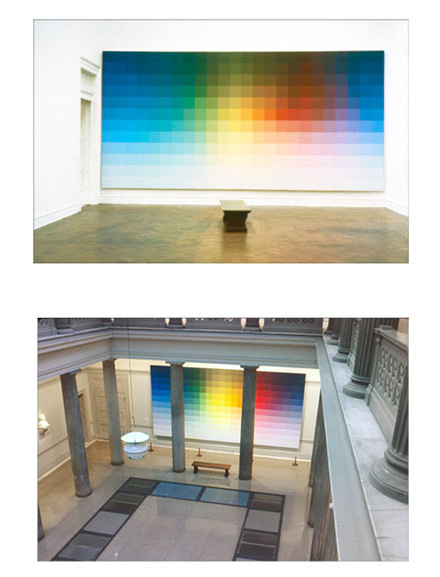 The next format was the 9’x9’ and 7’x7’ in that order (Figures 7 & 8), creating work in both formats simultaneously. 8’x8’canvases came after that group and did not overlap other formats (Figure 9). “This idea that the content of something is embedded in its formalism is very obsessive to me, and I’m very involved in that,” explains Swain. At first he thought the size of the individual square should be 10 inches. Then, one day, 13 inches looked better than 10; then 12 ¾ inches beat 13. “Everything I do is based on color relationships.” He wanted to work with a standard vessel and developed the square that would serve as a basic unit. At first he wanted to make sure the squares were small enough to assimilate into a mixture of color. If they were too large they would each dominate and not visually mix. He strived to optically mix the colored squares so the center would be the third color; he aimed to gain relationships from the combination of colors and would build on this theory in the creation of the work. Through this format, the effect of simultaneous contrast occurs; one side of the square appears lighter, while the other side of the same square looks darker, depending always on the neighboring color. Through these complex color relationships, Swain achieves an active canvas. The movement of color, the three-dimensionality of shape and the ever-changing color relationships make his paintings highly interactive. 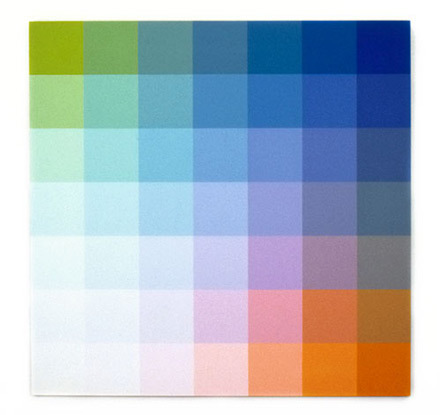 Swain concentrated on developing his color system during the early 1970s and has been invested in this development ever since. When he was first building his color system he would ask, “what it could do, how it could modulate, how it could build a finite system?” He referred back to Cézanne’s Provencal Landscape Near Les Lauves, at The Phillips Collection, which he spent considerable time studying and learning how Cézanne put his paint together. Swain believes form carries content over time. He overheard two people commenting about one of Warhol’s Elvis works at the Whitney. “He really draws very well. It really looks like Elvis.” From Warhol’s formal paradigm to his cultural paradigm, Swain conjures the question: In 25 years, will the cultural paradigm related to this work of Elvis Presley succeed in leading the viewer back to what Elvis represented as an icon? In contrast, Swain feels, Vermeer, an artist that he is particularly found of, endures because his work is not weighed down by iconography. When asked if he was closer to the Munsell color system, he agreed but also said that Ostwald should be looked at. Swain’s work is based more on intuitive investigation than any mathematical investigation. He refers to a quote by Albert Einstein, “The only real valuable thing is intuition.” Swain believes it is where everything surfaces. Every one of his colors is mixed by hand and he knows the location of each hue by its numeric notation. He does not go by other color descriptions such as ‘mauve’ and he claims he would not know what to say to you if you asked him what color to paint your house, despite his close relationship to color. Swain does not favor any colors; he sees them as all equal. “I’ve never met a color that I haven’t been interested in or fascinated with.” Swain admits, “Most of the problems I have with my work is the fact that I use excessive amounts of intellectual concepts. He confesses his mistakes are made when he allows his intellect to override his intuition. Swain’s Triangle No. 5 (1969) was among works by 39 artists, many of the well-known artists who were in “The Art of the Real” exhibition at MoMA two years prior. (fn 24) In Tucker’s discussion of Swain’s work she explicates, “[Swain] orders the color relationships in his work so that parts function in themselves at the same time that they are perceived as a whole. This is not, however, the ultimate purpose of the painting. No matter how stringent the logic and precision of color structure, the aim of the painting for Swain as well as for the other artists is the making of a kind of visual poetry.” (fn 25) She concludes, “Color acts directly on our sensibilities, independent of intelligible meaning. Color, like music, can be apprehended without recourse to ideas. We experience color without having to understand it, partly because by its very nature-its complexity, mystery, variety and adaptability.” (fn 26) This purely phenomenological experience has been and continues to be Swain’s main goal in his work. During the next two years, Swain participated in many group exhibitions in New York City and an architectural installation of a large-scale work for Phillip Mallis of Kahn & Mallis Associates in New York City. He received the first of ten grants from the Research Foundation of the City University of New York: Faculty Research Award Program for Color research and painting. 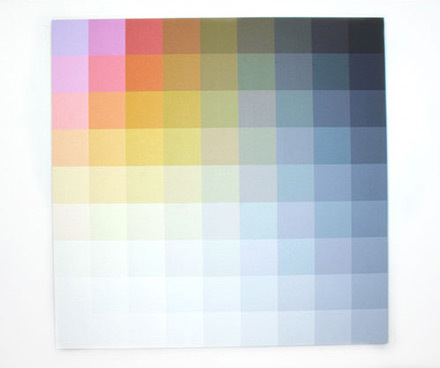 These grants allowed him to continue working with his color system, arriving at approximately 2,200 individually painted color components and also aided him in teaching color theory in his classes at Hunter College. In 1974, Susan Caldwell became Swain’s dealer and his professional career continued to grow. That year his first one-person museum exhibition was that spring at The Everson Art Museum in Syracuse, New York. His paintings from 1973 and 1974 were on view and the museum acquired one of the works for their permanent collection. Through the eight years that Swain was represented by the Susan Caldwell Gallery, he had four one-person exhibitions and seven group exhibitions at the Susan Caldwell Gallery alone. He was included in many important exhibitions including “Color as Language,” organized by the International Council of the Museum of Modern Art that traveled throughout Central and South America, including museums: Museo de Arte Moderno, Bogota; Museo de Arte Moderna de Sao Paulo; Museo de Arte Moderno, Rio de Janeiro; Museo de Ballas Artes, Caracas; and Museo de Arte Moderno, Mexico City. Swain appreciated being part of this exhibition and felt Kynaston McShine did a remarkable job organizing the show. His work also continued to enter a number of permanent collections such as the Virginia Museum of Fine Arts in 1974, the Detroit Institute of Art in 1975, The Columbus Gallery of Fine Arts in 1976 (after his one-person exhibition at the museum), Albright-Knox Art Gallery in1976, and both the Milwaukee Art Museum and The Denver Art Museum in 1980. “Every square in this series of squares is in the process of transformation,” (fn 29) states Gordon Brown from Arts Magazine. Swain has been quite prolific throughout his career, often having several hundred canvases in storage. While Susan Caldwell was his dealer, his work was stored in the basement of 383 West Broadway in Soho. A few days prior to March 13, 1989, a steam line burst in the storage area. Steam and 200° water soaked all of his paintings. It was discovered days later and the inspection of hundreds of paintings took months. Several works were 30 feet long. Ultimately, it was determined that 10 mural size paintings and another 26 of Swain’s major large works had been so severely damaged that they were beyond repair and were subsequently destroyed. The process started in 1989 and lasted until 1991. Swain strives for the viewer to be emancipated by his work, to experience a release into a new area, when the viewer gives over to the work of art. “Emancipation is very important to me.” He reads philosophers such as Jürgen Habermas, who spoke about emancipating the spirit, which parallels transcendental existentialism. He feels his work should have some revelation; however it is not social in a sense that is didactic. The gallery exhibitions continued at a steady pace; the National Endowment for the Arts awarded him two grants for painting, and in 1983 the Metropolitan Museum of Art acquired a work that had great meaning for Swain. It was the last painting that Tony Smith saw before his death and Swain titled it, For Tony’s Jane (1979), in recognition of Smith’s wife. The work appeared in a group exhibition, “Given and Promised” at the Metropolitan Museum of Art that same year. From the late seventies through the mid-eighties, he became increasingly more involved with commissions for corporations such as Harris Bank, Travenol Laboratories, Tupperware World Headquarters, IBM, Johnson & Johnson Headquarters (Figure 11) and a large-scale work to fit the vast entryway to the Slee Concert Hall for the University of Buffalo Headquarters (Figure 12). Most of these commissions were large custom architectural installations including architecture and design of space that was developed around the work of art. In 1982 Swain was promoted to Full Professor at Hunter College and his commitment to teaching deepened. He taught classes in painting with a focus on the subject that he has come to specialize in, Color Theory. He has participated in many faculty art exhibitions at Hunter College. Through the years his involvement with Hunter grows and he saw the need for the MFA students to have a gallery to exhibit their work. Swain organized a team of faculty and students to build the 12,000 square foot Times Square Gallery. He influenced the structure of the MFA program and was instrumental in solidifying art studios in the MFA building, providing students with proper painting facilities. His work was exhibited in The Times Square Gallery in the “Hunter College Faculty Exhibition” in 2000 and then again in 2002. In 2003, his work was included in “Seeing Red, Part II: Contemporary Nonobjective Painting,” curated by Gabriele Evertz and Michael Fehr, also in The Times Square Gallery. In 1998, Swain received the Distinguished Teaching of Art Award from College Art Association. Swain’s work continues to be exhibited in galleries and museums all over the United States including a return to the Corcoran Biennial for the 45th Biennial Exhibition. His work continues to be acquired by museums such as a recent acquisition from Albright-Knox Art Gallery, the fourth painting of Swain’s to enter their permanent collection. He speaks on artists panels such as “Tony Smith: Artists’ Responses” at the Museum of Modern Art in New York. Four decades later, he still lives and works at the same address in Tribeca but has expanded to four floors. His color theory evolves as he continues to explore new realms as an artist. His latest work, the brushstroke series, is a new exploration of the relationship of two or three hues, the role that size plays on sensation and form, and the tactile quality of the brushstroke (Figure 13). Future endeavors may include expanding his color chart and rebuilding it asymmetrically to represent the asymmetric spectrum. 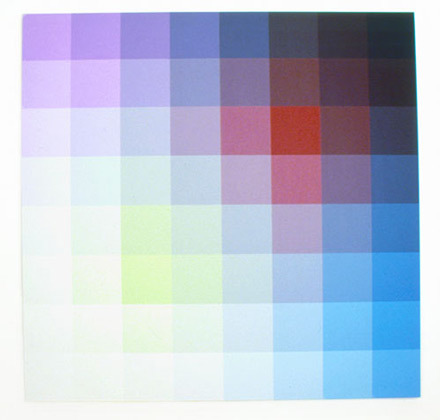 As quickly as Robert Swain’s career manifested, his legacy and innovative theories will have a lasting impact on the future of color painting and the education and evolution of color theory. 1. He was painting his masterpiece: “The Renate Series” at that time. 2. 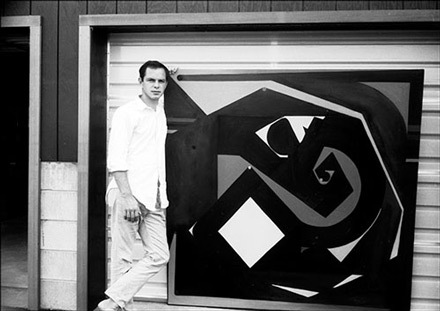 All that is left of these first abstract works are black and white photographs, Four Untitled Paintings, 36”x36” (1964-65) (Provincetown, MA); and Untitled (1964-65) (Provincetown, MA) that features him in front of his work. It is what he could afford at the time since he was still only getting paid $10 a week from Knaths. Swain is regretful of the black and white photographs because the works are painted in saturated hues, not black, white and gray. The progression of color is lost in the photographs; the black areas would have been color-changing in hue, modulating and the use of complementary colors cannot be detected. 3. This work was also documented by a black and white photograph which does not capture the nuances described. 4. Swain also identifies the “Primary Structures” show at the Jewish Museum in 1966, as another important influence on the paradigm of art history. 6. Swain mentioned Lannon, a big collector, was a major contributor to the Park Place. The cooperative gallery solicited their financing by getting collectors, donating work to the collectors in turn to finance the gallery and their exhibitions. 8. Scott Burton, “Art Reviews” Art News, October 1968, 67. 9. E.C. Goossen, The Art of the Real (New York: The Museum of Modern Art, 1968), 57-58. Exhibition Catalogue. 10. Ibid., Preface and Acknowledgements. 13. E. C. Goossen, “The Art of the Young, Not to Shock but to Make Real,” Vogue Magazine, 1968, 150. 16. Emily Wasserman, “Reviews,”Artforum, November 1968, 62. 18. Paul Richard, “Look at Robert Swain’s Painting. It Grows Stranger,” Washington Post, 16 February 1969, G1, G8. 20. Harris Rosenstein., “Reviews”, Art News, December 1969, 72. 21. Swain explains that “Baby Jane” Holzer purchased the work, for one of the malls her husband was building. She visited his studio to select the work. As she was looking at the painting she selected, Swain remembers her saying, ‘I just love this painting, there’s my favorite color.’ Swain did not know how to respond to this as his painting consisted of 200-300 colors. She took him to lunch at Max’s Kansas City, where she attracted a lot of attention as she was a celebrity amongst the Andy Warhol crowd. 22. 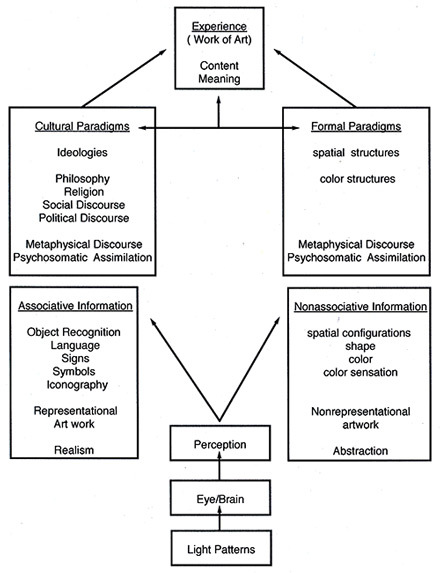 Robert Swain, “Experience (Work of Art) Content Meaning,” instructional diagram (Figure 10). 23. Marcia Tucker, The Structure of Color (New York: Whitney Musuem of American Art, 1971), Foreward and Acknowledgments. Exhibition Catalogue. 27. Roberta Smith, “Reviews,” Artforum, May 1976, 65-66. 29. Gordon Brown, “Art Reviews,” Arts Magazine, May 1976, 29. 30. Hayden Herrera, “Review of Exhibitions,” Art in America, May-June 1976, 106-107. Swain, Robert. “Experience (Work of Art) Content Meaning,” instructional diagram. Robert Swain, Artist, interviewed by author, New York, NY, 4 February 2009. Robert Swain, Artist, interviewed by author, New York, NY, 25 February 2009. Robert Swain, Artist, interviewed by author, New York, NY, 18 March 2009. Robert Swain, Artist, interviewed by author, New York, NY, 29 April 2009. Brown, Gordon. “Art Reviews,” Arts Magazine, (May 1976): 29. Burton, Scott. “Art Reviews” Art News, (October 1968): 67. Dreiss, Joseph. “Art Reviews,” Arts Magazine, (December 1974): 14-15. Goossen, E.C. The Art of the Real. New York: The Museum of Modern Art, 1968. Exhibition Catalogue. Goossen, E. C. “The Art of the Young, Not to Shock but to Make Real,” Vogue Magazine, (1968): 150. Herrera, Hayden. “Review of Exhibitions,” Art in America, (May-June 1976): 106-107. Harris Rosenstein, “Reviews”, Art News, (December 1969): 72. Richard, Paul. “Look at Robert Swain’s Painting. It Grows Stranger,” Washington Post, (16 February 1969): G1, G8. Smith, Roberta. “Reviews,” Artforum, (May 1976): 65-66. Tucker, Marcia. The Structure of Color. New York: Whitney Musuem of American Art, 1971. Exhibition Catalogue. Wasserman, Emily. “Reviews,”Artforum, (November 1968): 62.